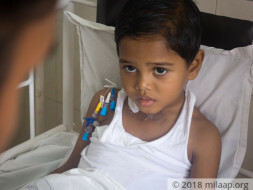 A 4-year-old kid Deepak, who is the son of a driver from Tirupur, Tamil Nadu, India is suffering from a rare blood cancer kind of a disease known as 'Thalassemia Major'. Thalassemias are inherited blood disorders that cause the body to make fewer healthy red blood cells and less hemoglobin than normal. Stem cell transplantation is identified as the treatment for this disease by Sri Ramakrishna Hospital, Coimbatore, India. 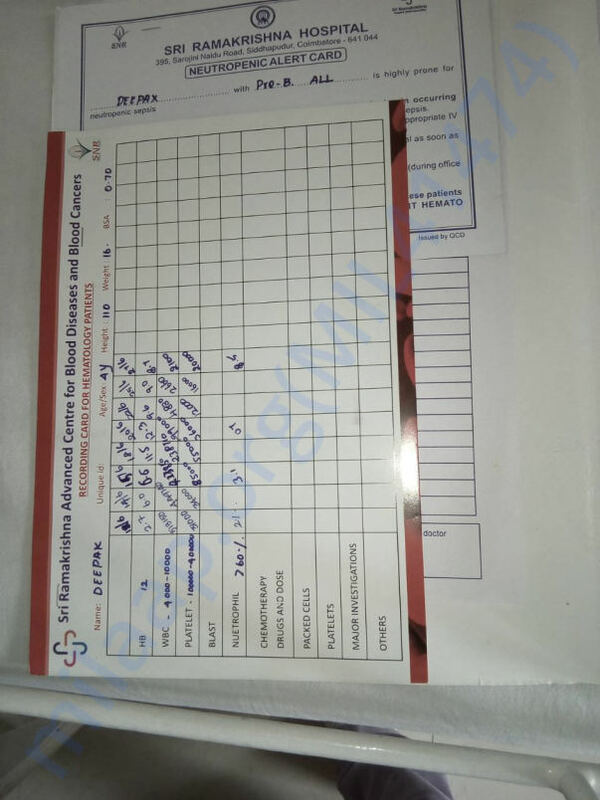 The original cost estimate of this treatment given by the hospital was INR Rs.12,50,000 (USD $20,000 approximately). 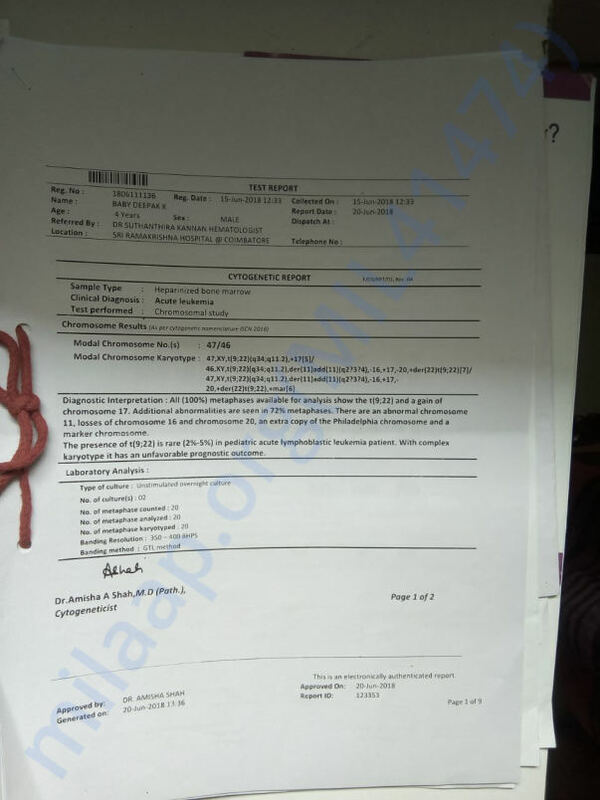 But due to some unavoidable circumstances, Deepak is now shifted to a different hospital KMCH, in the same Coimbatore city. 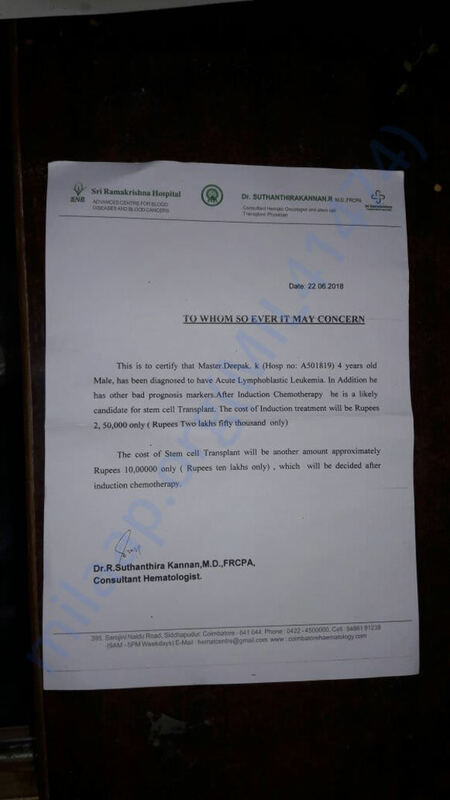 the doctors said that he had to undergo multiple cycles of chemotherapy, before the transplant which increased the expense to Rs.34,00,000 (around $55,000). Now that chemo was completed, Deepak is getting started with the stem cell transplant process. 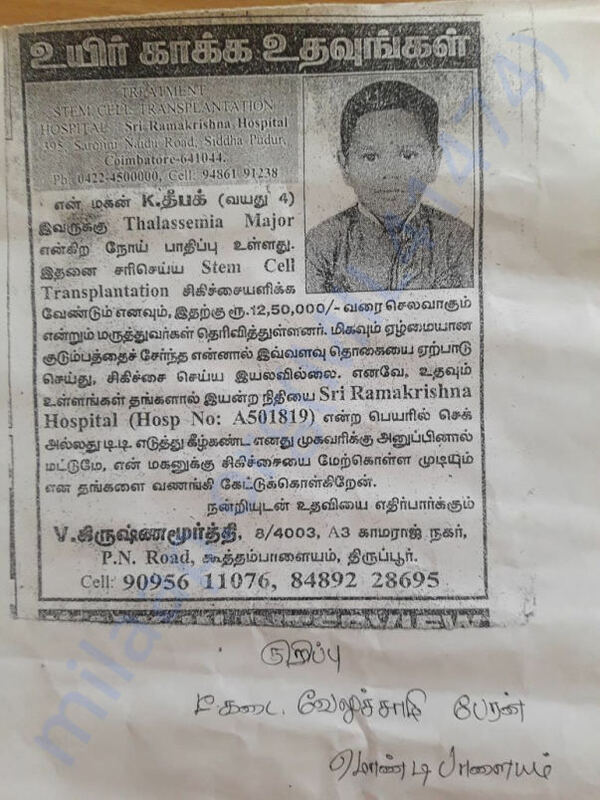 As the poor family of this kid, Deepak from a village in Tirupur cannot put together such a huge amount, they are pleading for help from people like us. Kindly do your bit to save the life of an innocent kid. Thank you! News paper ad of the patient kid Deepak. Thank you for your love! 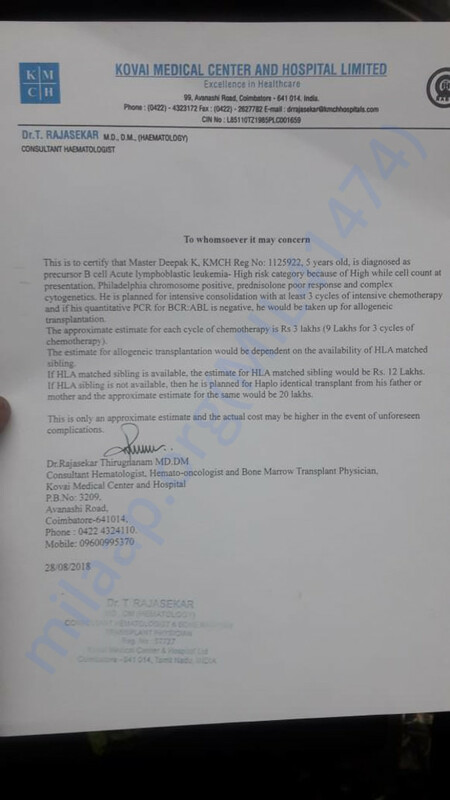 We are in final stage of treatment stem cell transformation treatment going to this week itself. We shall keep you posted. I am thankful to all of you for the immense support given to Deepak. He is presently in the hospital and doing well. He has completed 3 cycles of chemotherapy and will undergo radiation soon which will be followed by a cell transplantation operation. Please pray for his health and share the campaign further with your friends and family to help us raise funds faster towards his treatment. Will keep you posted. Deepak is at home and doing very well. He has completed the second cycle of chemotherapy and the doctors say that he will not be needing any more chemotherapy. The doctors suggest that he can now directly go for stem cell transplant next month. Please keep sharing the campaign in your network and keep praying for him! Thank you all so much.